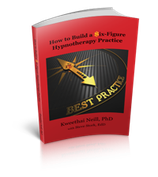 Hypnotherapists have great intentions to help others but often struggle financially. Dr. Kweethai has consistently earned 6-figure revenue from client fees in each year of practice. But that is only one definition of success. Note: Due to the high cost of shipping this book outside the U.S.we recommend you purchase the PDF version, available just below. When we receive your payment information we will send you the URL to download this product from our Google Drive. Dr. Kweethai left academia more than a decade ago to do work that resonated with her soul. A lifelong entrepreneur, she purchased an office property two weeks before completing her hypnotherapy certification. iHealth Center for Integrated Wellness, Inc. was founded on a simple business plan; to be successful - one client at a time. Too many hypnotherapists supplement their expenses from other income, treating their business more like a hobby. 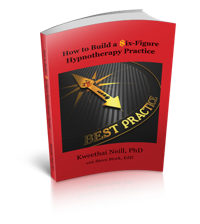 Success at hypnotherapy and success at business overlap, but are mostly unique. …appealing to clients who are happy to pay for the work. …owning your own calendar, reserving time to enjoy family and friends. …replacing the salary from a prior career. …living happily with the satisfaction of having acquired ‘enough’. After a successful career as a health professor, Dr. Kweethai left the halls of the University to practice hypnotherapy in the open classroom of the Universe-City. She brings to clinical hypnotherapy years of health knowledge, skills and wisdom; weaving her multicultural heritage, interdisciplinary training, and Eastern healing arts with scientific applications of the west. She enthusiastically brings spiritual health to the fore in the mind-body-spirit paradigm. Dr. Kweethai is a nationally known health educator and sought-after speaker and consultant. She is founder of the iHealth Center for Integrated Wellness and iHealth Hypnotherapy School in Roanoke, TX. Dr. Kweethai is a respected colleague who takes time to serve her professional organizations. She presents annually at professional conferences and serves on the Board of IMDHA. With co-writer Dr. Steve Stork, she is a regular contributor to the Unlimited Human, and an IMDHA Pen & Quill Award recipient. Business Advisory is one of many services Dr. Kweethai offers her clients as Chief Catalyst for Change. Dr. Stork is also a long-time academic, in health and teacher education; who chose to leave the ivory tower in favor of a more immediate impact on those seeking to improve their health and happiness. His skills in writing and editing make it natural that he now curates Dr. Kweethai's work. To further disseminate her work, he blogs for iHealth Center, DrKweethai.com and this website.